We all love pattern hacks, don’t we? I really do like patterns, especially the Burdastyle ones, and there are so many that I’ll never be able to sew them all. Nevertheless, sometimes you just want to add your own personal touch. And when you have a certain design in mind, but you just can’t find that particular pattern you’re looking for anywhere, you probably have to. Summer is (hopefully) coming soon and last year’s asymmetrical hem maxi dresses are in stores again (I like!). I actually didn’t buy any last summer, but I’m totally planning on sewing loads this spring. A lot of the patterns I have are from last year and older and Burdastyle didn’t have too many good asymmetrical hem dresses so far. That’s where the pattern hack comes in handy. You can just pick whatever dress pattern you like and change the dress skirt pattern into an asymmetrical one. You can also start drafting one from scratch and combining it with your favorite bodice pattern. A lot of people are afraid of drafting patterns. Yes, it’s complicated. Yes, you need to learn a lot of technique before you’re getting good at it and yes, it’s not too much fun in the beginning. But seriously, no one expects you to become a Lagerfeld, Marc Jacobs or Michael Kors overnight. I found that it’s less frightening and really fun to start with trying out minor pattern hacks, changing patterns you’re already familiar with. As you’ve seen with my waterfall dress, I just used a simple Burdastyle pattern and changed it a bit. As promised, I’m going to show you how I did it. Furthermore, I’ll show you what other changes are possible to get slightly different looks – there are so many different asymmetrical hem dresses! 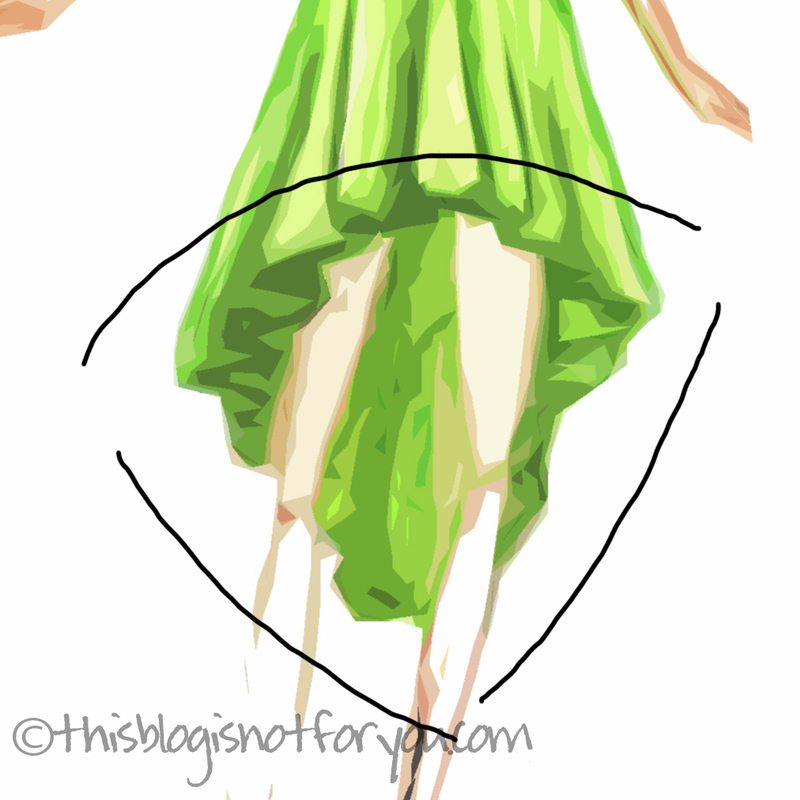 This is a draft of an asymmetrical hem that just about the same as the one of my waterfall dress. As shown in the picture below, the hem is straight in the centre front, sloped down at the sides and is quite straight (although not a 100%) again in the back. 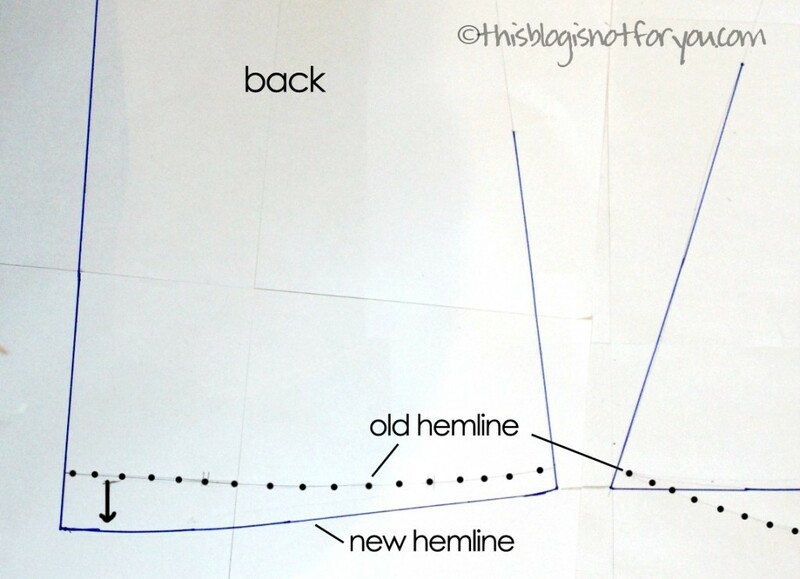 What you need to do is either shorten your pattern in the front or lengthen it in the back. Since I made the hem shorter anyway, I made the changes in the front. 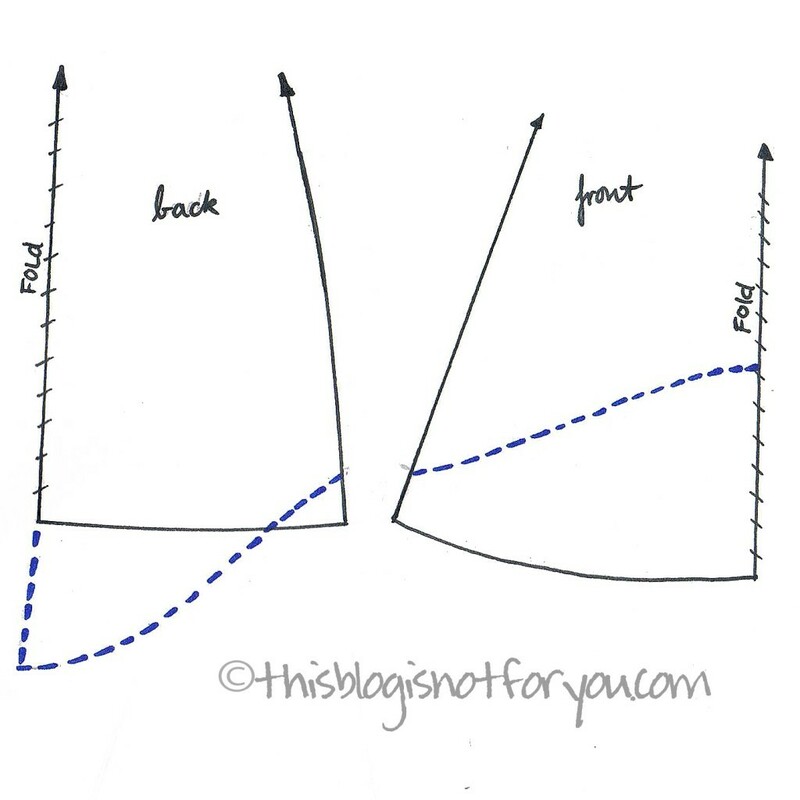 To get a more softer edge instead of a very triangular shape, you can’t just draw an asymmetrical staight line. The slightly s-shaped curve creates a smooth transition between front and back. 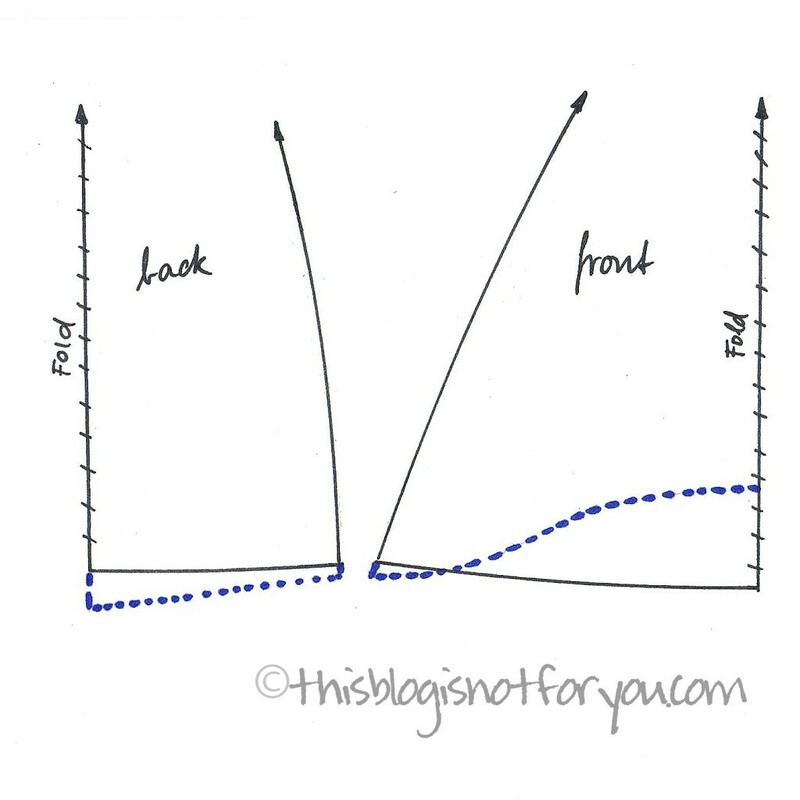 You also see the line sloping down more steeply only after it reaches the middle of the front pattern piece. There are only small changes to the back pattern, to make the changes look less abrupt and to avoid having it look like you combined two different pattern pieces. It’s also very important to make the pattern pieces the same length at the side seam. I very much love this look, because it looks quite romantic. Here the shape in the front is almost like the one in the first look, but the back is much longer and the transition from front to back is very smooth and it’s much more asymmetrical. To get this look you have to shorten the front and lenghten the back quite a bit. If it’s a knee-length dress, I’d suggest shortening the front by at least 20cm/8” and lengthing the back by about 20-25cm/8-10” or more. Give the line a smooth curved shape in the centre front and back to avoid awkward triangular edges. This is my favorite look and I’m de-fi-nite-ly making a dress like this for summer. It’s such an awesome femine look. Here, the front is straight almost until it reaches the side seams and then steeply slopes down to that long flowing train. To get a beautifully flowing skirt, you need not only to lengthen but also to widen the pattern. You could also just use a gathered-skirt pattern, if you don’t feel confident enough to make the changes yourself. If you have one that fits you well, use it and simply make the changes described above. Here’s an example of an asymmetrical dress with a very wide hem (which also means you’ll need loads of fabric!). 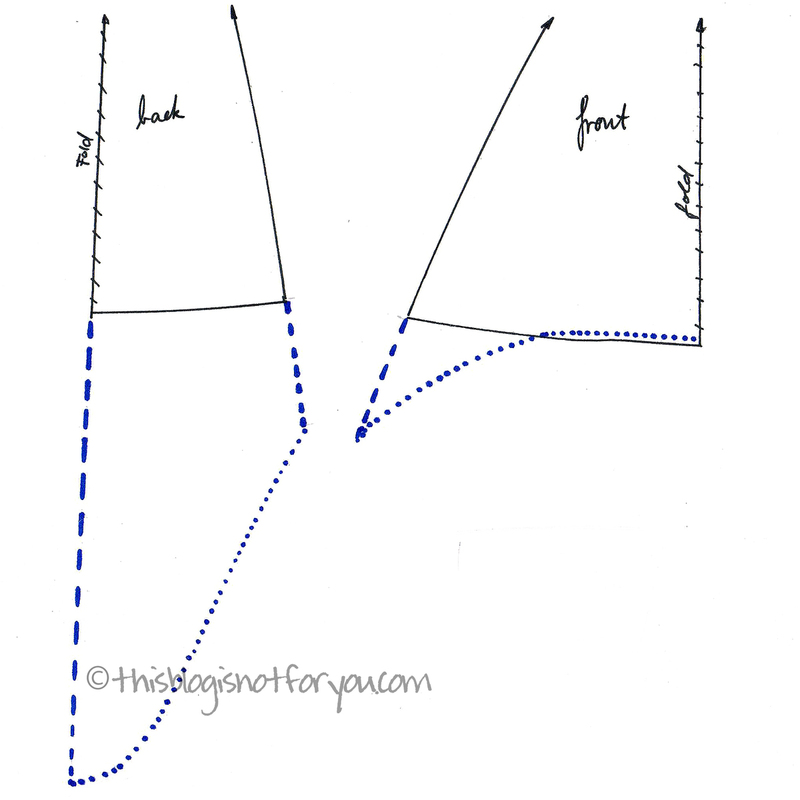 When you do not widen the hem of the pattern, the hem will probably end up looking like the one in the picture below. It’s also nice, but less romantic and flowing and probably more suitable for sporty and casual looks. I hope this was somewhat helpful and I’ll see loads of pretty asymmetical dresses in the upcoming months! 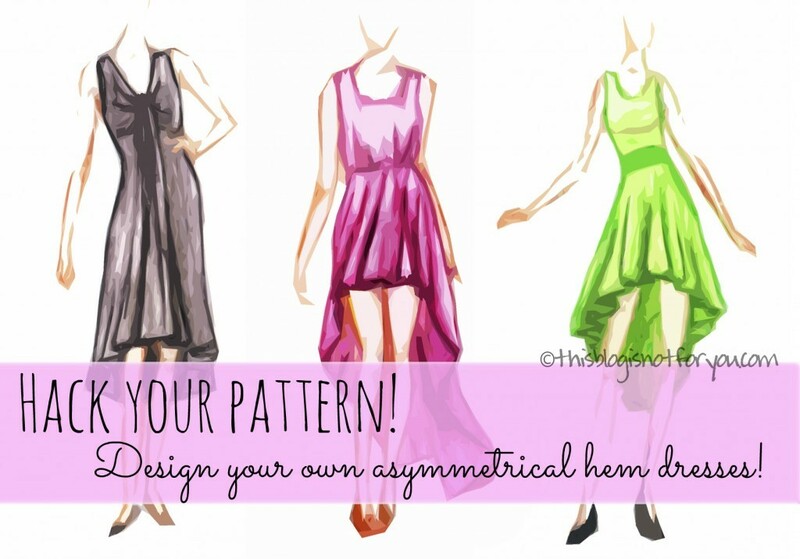 In case you decide to hack your pattern to make an asymmetrical dress for the summer, I’d love to see it when it’s done! Just send me a picture to hello(at)thisblogisnotforyou.com! Great post! I’m pinning to my pattern drafting board! I love this! I am pinning this for the future. The whole month of May we are going to be doing a Making for Mom series and I can see this tutorial is going to be used for a number of those projects. Thanks for the help! And even though this blog is not for us we are going to be following you to see what awesome thing you come up with next. This is such a helpful post, thank you! I think I need to make that red pinup dress! It’s gorgeous! Thanks for the head’s up! This is a great idea for taking something and reworking the pattern. I love your dress, too! Oh and I love the name of your blog! Thanks I’m going to make one just like the pink one just in a different color. I love these dresses! Where can I buy the pattern that you altered? I would really like to try this! It’s actually not that hard. It was one of the very first dresses I sewed as a beginner. Just make sure you use stretch fabric, otherwise I might get too tight or you would need to insert a zipper. Great Post! helpful for someone like me who wants to DIY.. 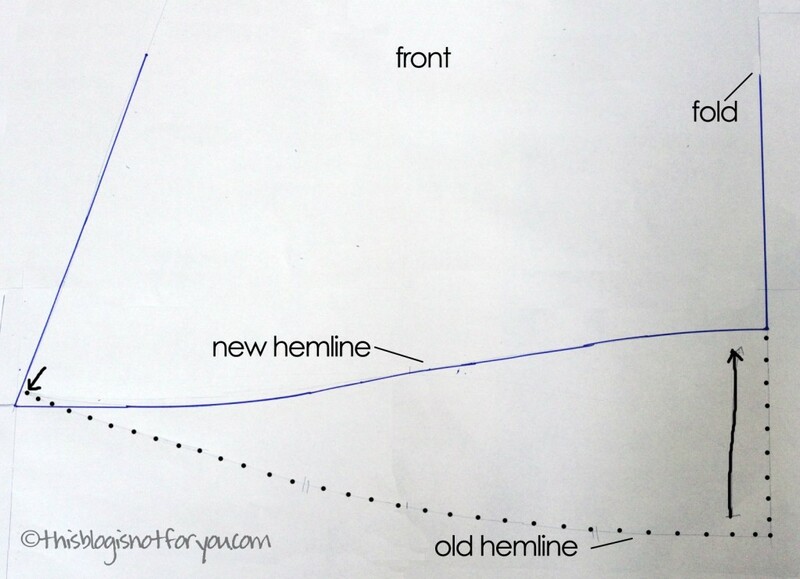 Thank you so much for the great explanation on creating asymmetrical hems. It’s been very useful. While reading your blog, I noticed that some of the pics were missing. From your description, I think they may apply to what I am attempting. Can they be fixed? Thank you, again!! Thanks a lot, the illustrations came really handy. I never knew icould make a fine dress using burda pattern. But thanx to u now i have an idea. 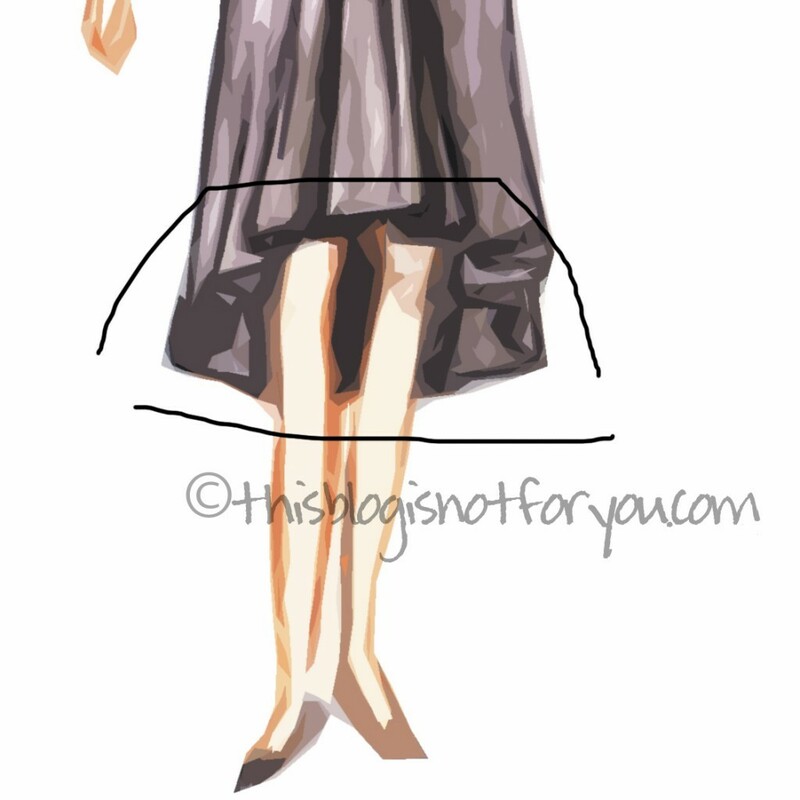 I want u to show me how to do an asymmetric hem on a gathered skirt. 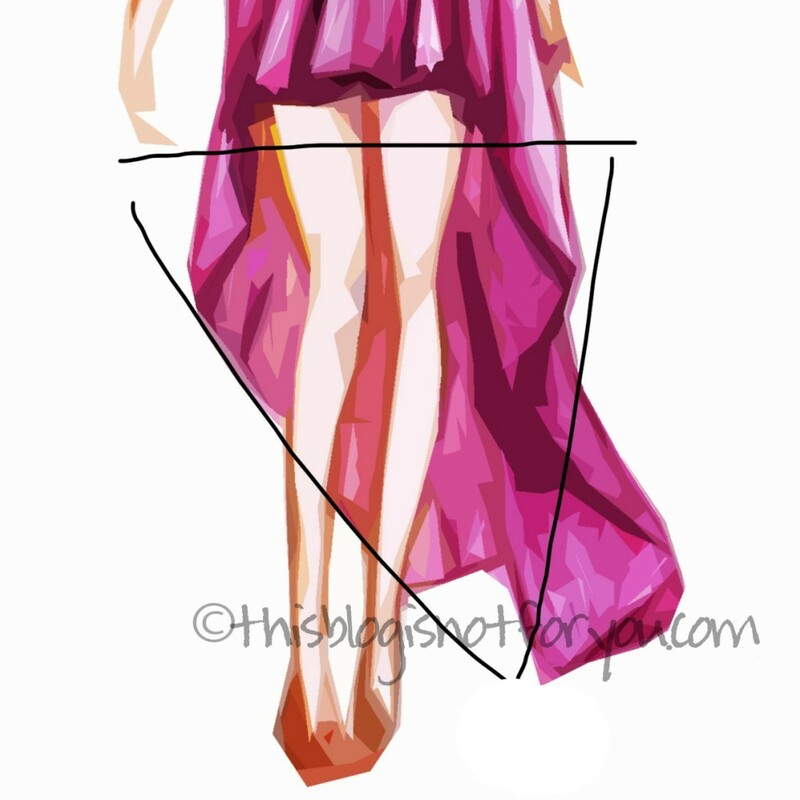 wow I love dis.I have been thinking on how to cut ASYMMETRICAL HEM DRESS PATTERN.